There truly is no limit to what’s possible when it comes to basement remodeling – as long as you partner with a leisure space specialization company like U.S. Patio Systems and Home Remodeling. In addition to utilizing high-quality building materials, we proudly lay claim to a large portfolio of basement projects that reflects our dedication to craftsmanship. 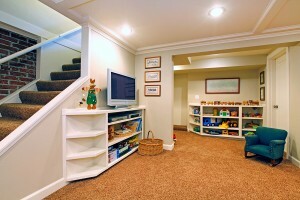 If you can dream it, the basement remodeling pros on our team can make it happen. We can install wood-frame basement walls with high R-value insulation, lighting, plumbing, flooring, surround-sound speaker wiring, a basement kitchen, a basement bathroom – anything you need to make your basement livable. For more information about the basement remodeling services that are available from U.S. Patio Systems and Home Remodeling in St. Paul, MN, please contact us today. We are accredited by the Better Business Bureau and are staffed by individuals who have many years of on-the-job home remodeling experience. Should you require financing, we will be more than happy to assist you with that, as well.